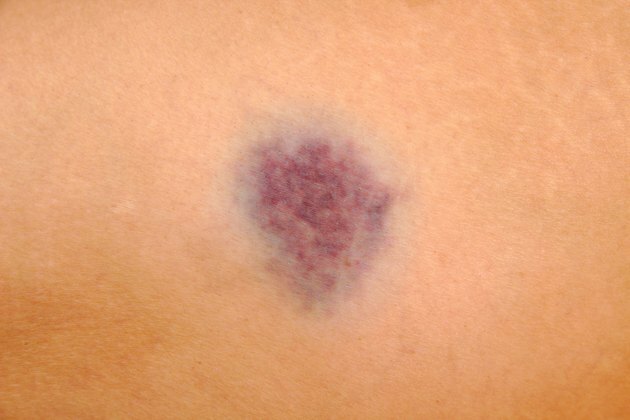 Black-and-blue marks, or bruises, are spots in which you've sustained bleeding under the skin. Bruising usually occurs after a trauma like falling down, bumping into something or getting hit. If the injury you've experienced is large or serious in nature, you may not be able to prevent your skin from turning black and blue. However, treating the site of trauma right away may be able to prevent widespread bruising, and in some cases you can completely avoid the telltale discoloration. Prop up the injured area of your body on pillows and rest. The Rodale book The Doctor's Book of Home Remedies for Seniors explains that when you elevate the area in which you expect bruising, blood is directed away from the injury site, and is less likely to pool and create a black-and-blue mark. Rest also helps the tissues and blood vessels heal more quickly. Ice the site of your injury with cold packs immediately after you've hurt yourself. Ice can contain some of the bleeding that occurs under your skin by causing the blood vessels to constrict, which may minimize the extent of your bruising. Apply ice for 15 minutes at a time, up to five times daily during the first 24 hours post-injury. Improve circulation to your traumatized skin and tissues by applying heat, starting on the second day after your injury. Promoting circulation to the area in which you may become black and blue can speed healing with minimal discoloration and discomfort. Wrap your injury with a compression bandage and continue to elevate it for a few days. According to The Doctor's Book of Home Remedies for Seniors, compression keeps the blood from broken blood vessels from seeping into the surrounding tissues, which causes a bruise. Eat a healthy diet that contains plenty of vitamin C to prevent black and blue marks. PeaceHealth, a source for alternative medical treatments, explains that people who are deficient in vitamin C may experience bruising more easily than other people. Eat citrus fruits, broccoli, tomatoes, strawberries and potatoes or take a supplement to get at least your recommended daily allowance of 75 mg, suggests the Linus Pauling Institute. Ask your doctor about treating bruises that do appear on your skin with natural herbs, such as arnica or comfrey. PeaceHealth explains that these two herbs are often used topically to ease bruising, though evidence of efficacy is primarily anecdotal rather than scientific in nature.